We haven’t written about creative iPad decal for a long time. Apparently it’s not because there is no good iPad decals, for instance, the following Super Mario Question Box iPad decal. Just as we see, a line of question boxes from Nintendo Super Mario video game series is cleverly arranged under the black Apple logo, and the center half question mark make the drawing look like someone knocks the apple out from the question box. Who can the fellow be? Mario or Luigi? As usual, the iPad decal is made of vinyl sticker, and can be applied and removed with ease. Moreover, you can also ask the crafter to customize the iPad decal including the size and color. 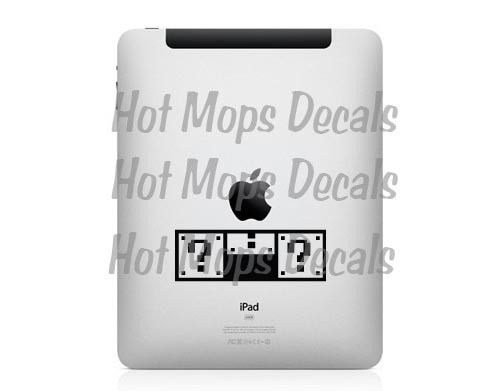 The Super Mario Question Box iPad decal is priced at $7.99 USD. If you’re interested, jump to Etsy for more details. Additionally, don’t ever miss other nice iPad decals such as the Zombie Snow White iPad decal, Pacman iPad decal, and more through “iPad decal” tag.